When Navy Pier's public spaces get their long-awaited makeover, a team led by a New York landscape architect will be calling the shots. James Corner, who helped design New York's High Line -- a public park that sits on top of old railroad tracks on the West Side of Manhattan -- has been recommended by a Navy Pier committee to lead the project. The ideas brought by Corner and his team, the board said, combined imagination and function without going overboard. "They weren't so far out there that -- I mean, we asked them to dream big, but they dreamed big but were able to do it in a way that we thought we could pay for," said board member Sarah Garvey. The team would also include New York-based architects, lighting artists and lighting designers. A graphic design firm from Toronto and a water design and engineering firm from Los Angeles would also be a part of the team. Chicago designers did not miss out completely. The recommendation also calls for Chicago-based landscaped architects, art curator, civil engineers and construction management. 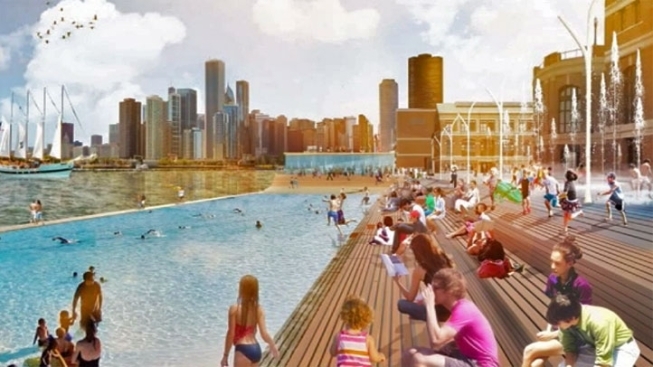 The competition to redesign the pier actually began months ago, with 52 initial entries. Five finalists were unveiled in late January. Critics agree that Navy Pier is long overdue for a makeover. And any redesign project, which would be paid for with grant money and donations, could be completed by 2016, the pier's 100th anniversary.